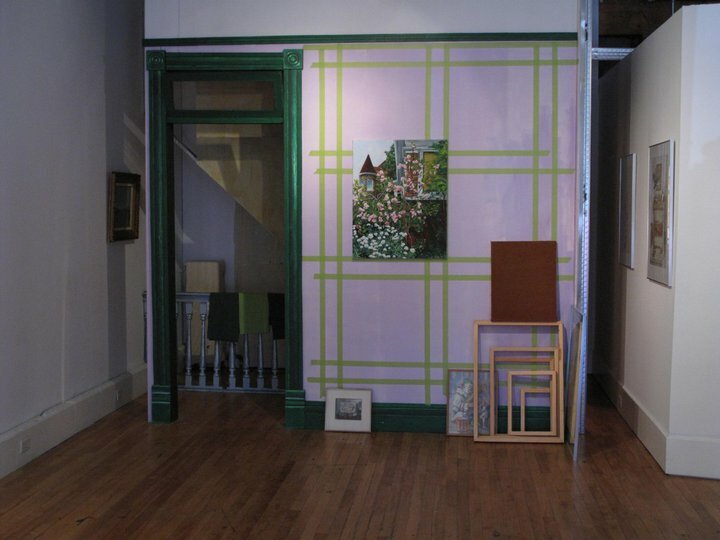 Re-Creation, installation view at Niagara Artists Centre; 2010; size variable, approx. 3.05 x 3.65 x 2.75 metres (10 x 12 x 9 feet); metal, drywall, plaster, plywood, latex paint, wood, muslin, silk, t-shirts, light fixture, and artworks. Artworks used in the installation visible in this photo, left to right; Bird on Finger, 2005, ink on paper, 59.7 x 43.2 cm (23.5 x 17 in); Extinction, unfinished dinosaur painting started December 27th, 1983, watercolour on plywood, 106.7 x 116.8 cm (42 x 46 in); Apollo of the QEW (a.k.a. The Colossus of Roads), 2006, enamel and spray enamel on acetate, 27.9 x 21.6 cm (11 x 8.5 in). Installation view of Untitled and Unrelated Drawings Applied Directly To a Green Wall (centre), part of the exhibition, new! at Rodman Hall Art Centre, September 2008 - January 2009, with artworks by, left to right, Sheldon Rooney (partial), Melanie MacDonald, John Gill (right of centre), Carolyn Wren, and Tobey Anderson (partial). The mural work, Untitled and Unrelated Drawings Applied Directly On a Black or Green Wall, is intended not as a contrarian statement about the business of mounting art in galleries, but, in a world of rapid and unrelentingly accelerating change, as a fleeting glimpse at the early 21st century, Western human condition (so far), as filtered through one individual’s psyche. This representation of the hurly burly of contemporary existence, populated by anthropomorphisms taken from the artist’s personal iconography, would feature maps, ironic words and phrases, pointless and pointed questions, product packaging, desultory interactions, television themed imagery, and so forth. In a most often white environment a black or dark green wall is introduced along with the attendant automatic illusion of infinite space. 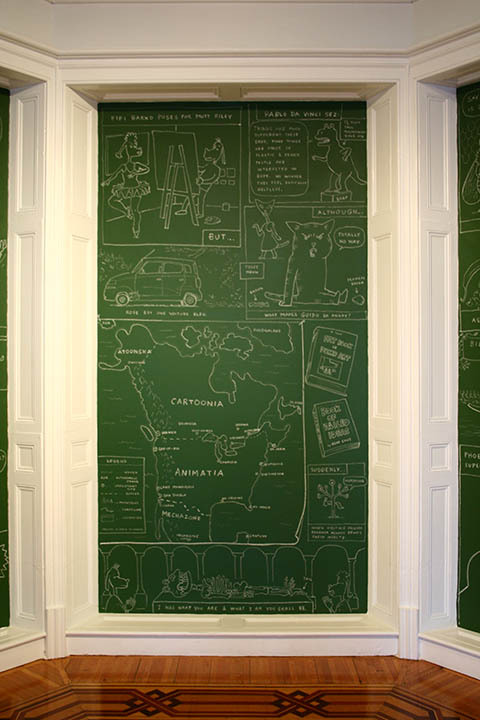 The black or green references the colour of the chalk boards in use in elementary and secondary schools implying that life, and a life in art, is an ongoing learning experience. 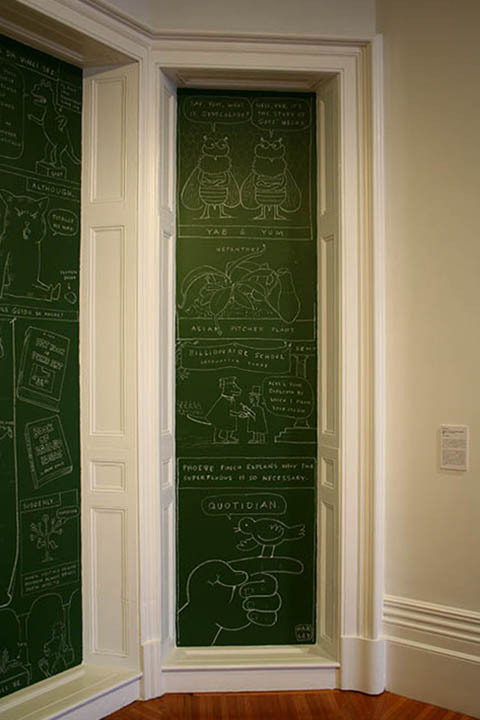 Drawing directly on the wall subverts the notion of a studio/gallery split, placing the artwork in a continuum of activity centered around the artwork itself and its potential for success or failure. The drawing’s polarity, usually a black line on a white ground, is reversed, highlighting the immediacy of the act of creation as well as introducing such notions as the fragility of the material clinging by air pressure to the wall, and the temporality not only of the work itself, but, by extension, all that exists. Cartoonism; 2005; installation view at Niagara Artists' Company with, left to right, Thomas and Welland (on rudimentary plaid), Three Strips (Politics, Art, Life), and Cartoonism (on red). 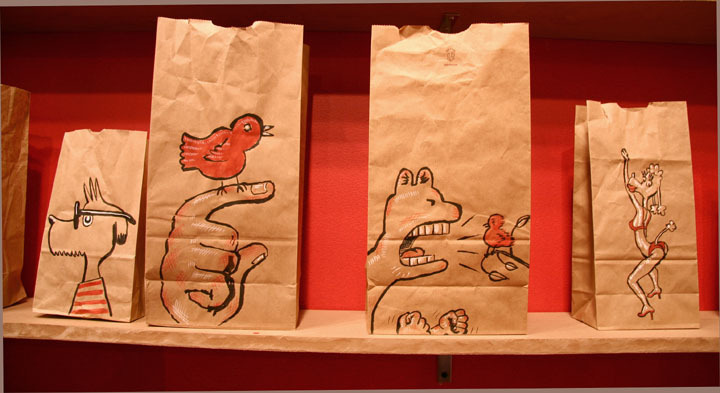 Cartoonism; 2005; installation view at Niagara Artists' Company with, left to right, Title Bag, Vista (on black), Thomas and Welland (on rudimentary plaid), and Three Strips (Politics, Art, Life). 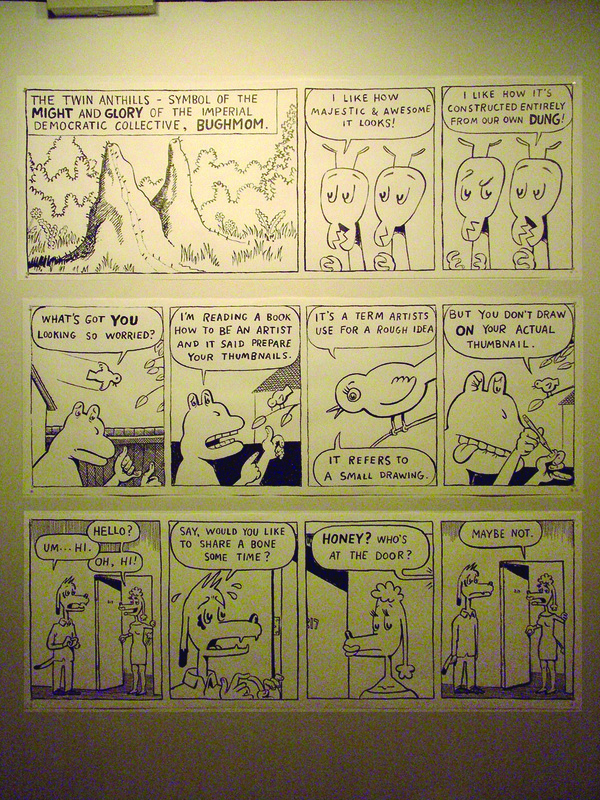 Also exhibited as Four Strips (Politics, Art, Life, Politics) at MoCCA (Museum of Contemporary Canadian Art), 2005, part of the show The Blood Must Continue To Flow, curated by Istvan Kantor. Also exhibited at MoCCA (Museum of Contemporary Canadian Art), 2005, part of the show The Blood Must Continue To Flow, curated by Istvan Kantor. "No bird has the heart to sing in a thicket of questions." What kind of art best describes your life? You'll have a better idea of what "kind" of art to look for. You'll never believe what kind of art we have here. What kind of art do I do? do you do? do you have? What kind of art are you into? am I into? What kind of art could be actively termed as being not “socially engaged”? What kind of art are you showing others? What kind of art beats within you? Consider the question of what kind of art you must possess. What is this thing called art that always ends in tears? What is this thing called art, and what will it become in the future? What is this thing called art? Dollars and sense. Just exactly what is this thing called art? “What is this thing called art?” will begin at 7:30 pm. I don't want to steer anybody wrong with what kind of artist I am. What kind of artist does this work? I don't know, ultimately, what kind of artist I'll be. There is no question that (Pablo da Vinci) is an artist, but what kind of artist is anyone's guess. Art is math is art for (Profezzor Zeinstein). The average person trying to understand art is completely disoriented. Art is what is made by an artist. Art is a copy of nature. Art is a vastly diverse enterprise. The artist is the confidant of nature. The position of the artist is humble. The artist is too emotionally involved. The artist (if not art itself) is still engaged in a progress toward "the good." The artist is continually tempted to sever the dialogue they have with an audience. It may be that the artist is not recouped. The artist is then in a cash flow bind. The artist has had the wit to ask more questions than other people. Art becomes the enemy of the artist. The highest good for the artist is to reach the point where goals of excellence become insignificant. Let’s just see how ready you can be. Let’s just see if you can make a bomb. Let’s just see how smart you are. Let’s just see how this is gonna look. Let's just see, though, if this is a major scandal. Let's just see if it receives one-tenth the attention. Let’s just see how stupid they really are. Let’s just see who the best person would be. Let’s just see what he has to say about this. Let’s just see whose story is the most unusual. All artworks will be assessed by a jury of Bulgarian artists. All artworks involve the cooperation of everyone whose activity has anything to do with the end result. All artworks are about something. All artworks involve some moral content. Keep a safe distance from all artworks. 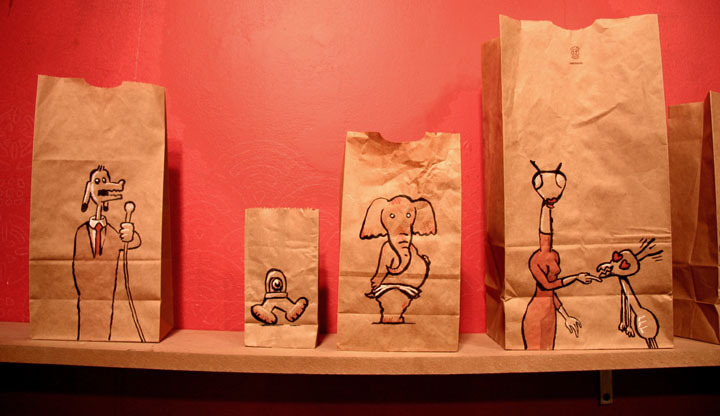 All artworks have their own sense of order and composition. The alphabetical listing of all artworks is the main concern. 1. Is the artwork competent? 2. Is the artwork unlawful? 3. Is the artwork dangerous? 4. Is the nature of the work such to disrupt the educational process? 5. Does the artwork create excessive maintenance or damage? All artworks will be returned after the contest. All artworks must be original and ready for display. “The work of art," says Andre Breton, "is valuable only in so far as it is vibrated by the reflexes of the future." By owning the work of art, you share in its ritual power. A [one] who concentrates before the work of art is absorbed by it. In contrast, the distracted masses absorb the work of art. By the absolute emphasis on its exhibition value, the work of art becomes a creation with entirely new functions. The value of the work of art is determined by its capacity to transcend the limits of its chosen medium. Emotion is not the significant content of the work of art. Associations and experiences meet with "the evidence" found in the work of art. The work of art is not a moral agent in the full-fledged sense.